Working from balls of hair recovered from Siberia, scientists have reconstructed two-thirds of the woolly mammoth's DNA sequence. 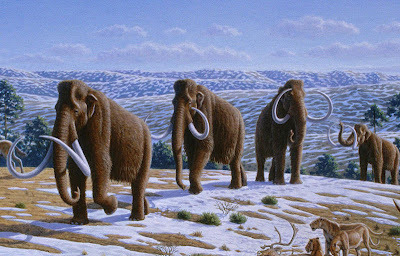 The mammoth, a close relative of the modern-day elephant, has been extinct for ten thousand years (although there is some evidence that they lived as late as 1,700 B.C. and possibly survived into even more recent times). There has been discussion for several years about possibly "resurrecting" the mammoth, by using its DNA and fertilizing the egg cells of modern elephants. There is also said to be potential to bring back the quagga and the Bali tiger, and a few have even suggested using genetic technology to restore the passenger pigeon, which was once the most numerous bird in North America. Admittedly there's a long way to go still, but it wouldn't surprise me if within a decade we might yet hear news of a baby mammoth being born.